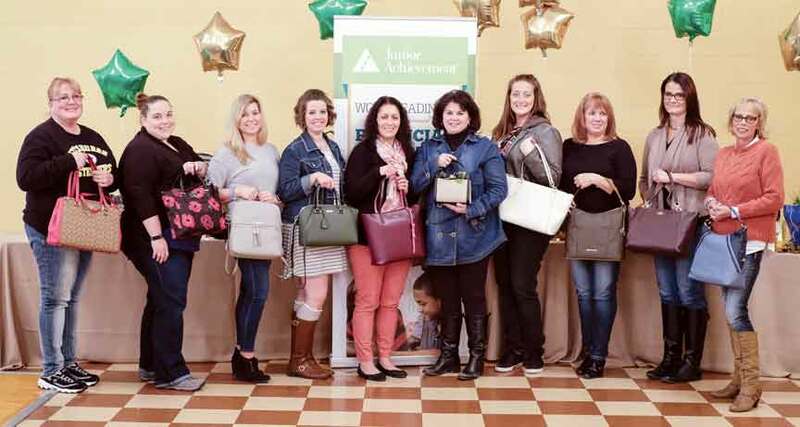 SAYBROOK TOWNSHIP - A group of women walked away with new designer handbags on Friday, Nov. 9, as they gathered at the Say- brook Banquet Center to raise funds for Junior Achievement of Ashtabula County. Designer Bag Bingo has become a popular fundraiser for organizations in recent years, and Junior Achievement officials decided to jump on board the trend. Junior Achievement held its first Designer Bag Bingo in May, with great success. This go around, all 300 tickets sold out. Junior Achievement provides programs focused on financial literacy, workforce readiness and entrepreneurship to students in the county. Locally, more than 2,000 students in grades kindergarten through 12th are served. Since JA programs are offered at no cost to area schools, the organization needs financial support to provide these services. All of the money raised from the Designer Bag Bingo will go to JA and ACCESS, said emcee Dave Bucci. Lake City Plating was a title sponsor at the event, and owner Todd Bendis, a Steering Committee member for JA, spoke at the fundraiser about the benefits of JA programs. He read what he described as a “compilation” of these letters. “You taught me what a credit score is...You taught me that insurance can protect me from unexpected events,” Bendis read. practical information that will help prepare them for the working world. Volunteers for the program were asked to stand up and be recognized during the Designer Bag Bingo. Ten women walked away with new designer handbags at the Designer Bag Bingo.